With its rugged, big tractor features, the Massey Ferguson GC1700 Series delivers impressive performance, easy-on-and-off implements - plus 0% financing for 60 months in the U.S. and Canada. Whether you’re a residential customer or a seasoned professional, you'll be impressed by how the GC1700 Series stacks up to its sub-compact competition. The 8600 Series from Massey Ferguson. Boost your power and productivity with a specially-priced Massey Ferguson high horsepower tractor. Visit your local dealer or our offers page to learn more. This big tractor comes with big innovations, delivering high performance with best-in-class emissions and fuel efficiency. The 9500 Series Axial Combines from Massey Ferguson. A direct result of listening to combine users, the 9500 Series combine combines rugged basics with advanced technology to deliver what you really want: more clean grain in the grain tank with less downtime, less maintenance - and less fatigue. The Command series corn head is a totally new AGCO®-designed and built header that delivers increased capacity, faster harvesting rates and exceptional performance in downed corn with reduced header loss relative to both cobs and overall corn loss at the header itself. Take command of your harvest with the new 3300 Command series corn heads from Massey Ferguson. New standard capabilities give your operation new harvesting opportunities. The Massey Ferguson 4200 pickup header provides the right platform to feed those large grain swaths without issue. 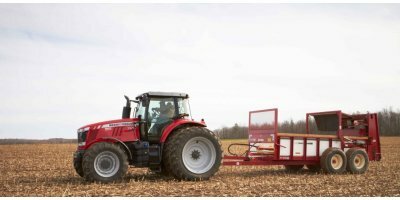 Whether you are harvesting canola in western Canada, or grass seed in the western United States, the Massey Ferguson 4200 header will provide direct even crop flow into the combine. These heads have been designed with an emphasis on performance and reliability to ensure you harvest flows smoothly. If you're going to be loading with a powerful tractor, you'd better have a front loader that's just as strong, stable and hard-working. Mission accomplished - with Quicke Dimension Series front loaders from Massey Ferguson. The 1700 Series Hesston Economy Round Balers from Massey Ferguson. Got a 30+ hp tractor? 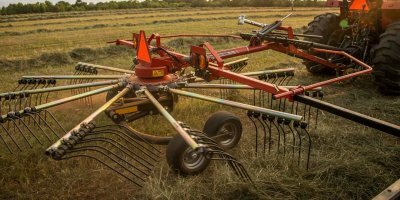 Need a cost-effective round baler? The 1700 Series gives you Hesston reliability at an economical price. These balers are low on cost, but high on quality construction and advanced features. 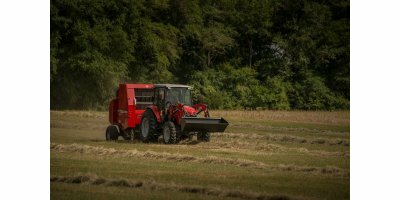 The 3’x4’ and 4’x5’ balers in the 1700 Series lineup are a perfect match for smaller scale operations focused on dry hay production. 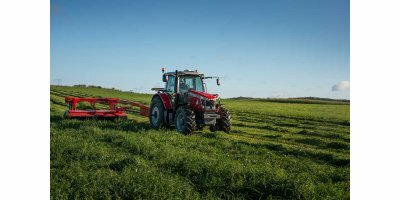 The 1300 Series Hesston Mowers from Massey Ferguson. 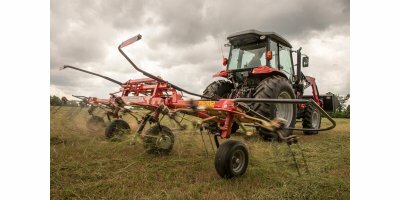 From economy models with conditioning options to advanced center-pivot disc models, the rugged 1300 Series Hesston mowers are all you need to bring in your hay crop quickly - and in great condition. 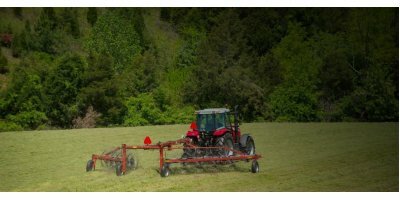 Rely on the innovative features of the 1300 Series to cut a wide swath through grass hay, pasture or alfalfa with equal ease. 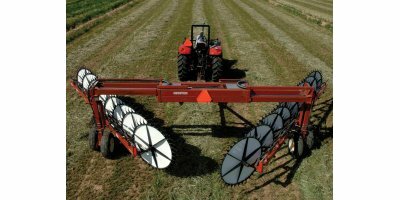 The Model 5130 Heavy-Duty Wheel Rake from Massey Ferguson. 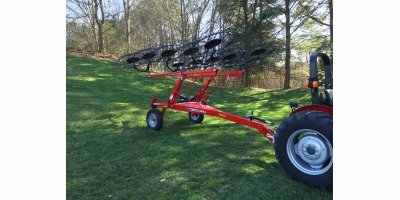 Need a ruggedly built wheel rake that will work for your commercial operation for many years to come? The Model 5130 was made for you. Designed to fit both custom and commercial operations, RK Series single and dual rotary rakes gently sweep the crop into even, fluffier windrows for faster drying and better baling. 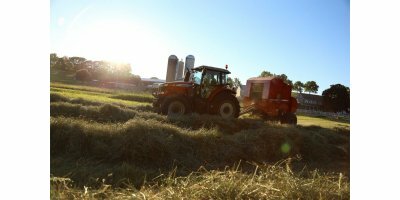 From its innovative suspension to its clean gathering action (without all that dirt and debris), the RK Series delivers a well-formed windrow that leads to higher quality hay. 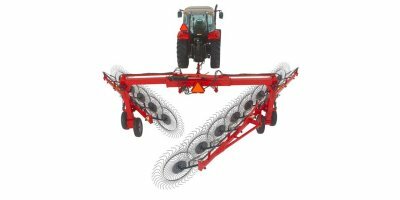 The SV Series Y Rake from Massey Ferguson. You name it. The SV Series is ready to make it happen. The 3700 Series Manure Spreaders by Massey Ferguson. Whether you have 50 dairy cows in a loafing barn or you’re finishing 15,000 beef steers in your feedlot, the 3700 Series has exactly the manure spreader you need. No doubt about it. We've got a big spread of spreaders. Choose from 14 innovative models from 105 to 479 cubic ft. (175 to 660 bushels) in 3 configurations - plus a wide range of options.